Enasidenib (AG-221) is an experimental drug in development for treatment of cancer. 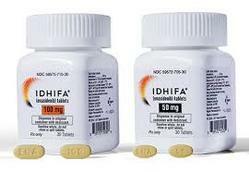 It is a small molecule inhibitor of IDH2 (isocitrate dehydrogenase 2). It was developed by Agios Pharmaceuticals and is licensed to Celgene for further development. 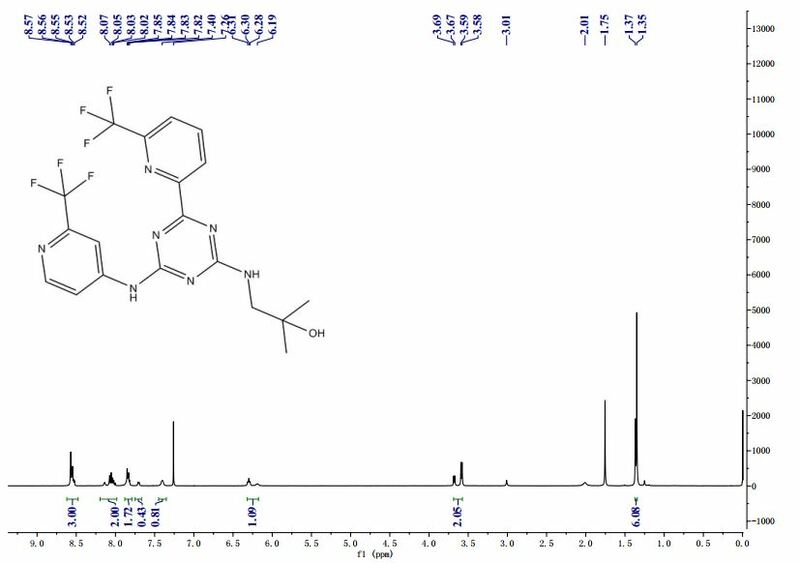 1H NMR (METHANOL-d4) δ 8.62-8.68 (m, 2H), 847-8.50 (m, 1H), 8.18-8.21 (m, 1H), 7.96-7.98 (m, 1H), 7.82-7.84 (m, 1H), 3.56-3.63 (d, J=28 Hz, 2H), 1.30 (s, 6H). 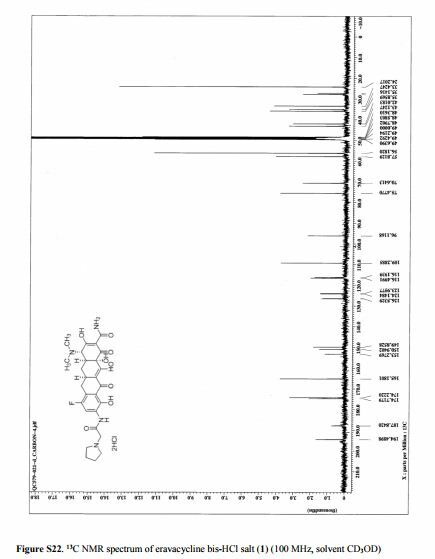 LC-MS: m/z 474.3 (M+H)+. The FDA granted fast track designation and orphan drug status for acute myeloid leukemia in 2014. 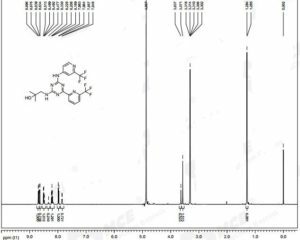 An orally available inhibitor of isocitrate dehydrogenase type 2 (IDH2), with potential antineoplastic activity. Upon administration, AG-221 specifically inhibits IDH2 in the mitochondria, which inhibits the formation of 2-hydroxyglutarate (2HG). This may lead to both an induction of cellular differentiation and an inhibition of cellular proliferation in IDH2-expressing tumor cells. IDH2, an enzyme in the citric acid cycle, is mutated in a variety of cancers; It initiates and drives cancer growth by blocking differentiation and the production of the oncometabolite 2HG. Isocitrate dehydrogenases (IDHs) catalyze the oxidative decarboxylation of isocitrate to 2-oxoglutarate (i.e., a-ketoglutarate). These enzymes belong to two distinct subclasses, one of which utilizes NAD(+) as the electron acceptor and the other NADP(+). 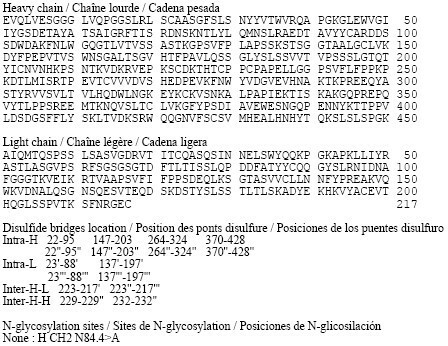 Five isocitrate dehydrogenases have been reported: three NAD(+)-dependent isocitrate dehydrogenases, which localize to the mitochondrial matrix, and two NADP(+)-dependent isocitrate dehydrogenases, one of which is mitochondrial and the other predominantly cytosolic. Each NADP(+)-dependent isozyme is a homodimer. EMBL/GenBank/DDBJ databases; and The MGC Project Team, Genome Res. Isocitrate + NAD+ (NADP+)→ a-KG + C02 + NADH (NADPH) + H+. It has been discovered that mutations of IDH2 present in certain cancer cells result in a new ability of the enzyme to catalyze the NAPH-dependent reduction of α-ketoglutarate to R(-)-2-hydroxyglutarate (2HG). 2HG is not formed by wild- type IDH2. The production of 2HG is believed to contribute to the formation and progression of cancer (Dang, L et al, Nature 2009, 462:739-44). The inhibition of mutant IDH2 and its neoactivity is therefore a potential therapeutic treatment for cancer. Accordingly, there is an ongoing need for inhibitors of IDH2 mutants having alpha hydroxyl neoactivity. Isocitrate dehydrogenase is a critical enzyme in the citric acid cycle. Mutated forms of IDH produce high levels of 2-hydroxyglutarate and can contribute to the growth of tumors. IDH1 catalyzes this reaction in the cytoplasm, while IDH2 catalyzes this reaction in mitochondria. Enasidenib disrupts this cycle. The drug was discovered in 2009, and an investigational new drug application was filed in 2013. In an SEC filing, Agios announced that they and Celgene were in the process of filing a new drug application with the FDA. The fast track designation allows this drug to be developed in what in markedly less than the average 14 years it takes for a drug to be developed and approved. 1H NMR (METHANOL-d4) δ 8.62-8.68 (m, 2 H), 847-8.50 (m, 1 H), 8.18-8.21 (m, 1 H), 7.96-7.98 (m, 1 H), 7.82-7.84 (m, 1 H), 3.56-3.63 (d, J = 28 Hz, 2 H), 1.30 (s, 6 H). 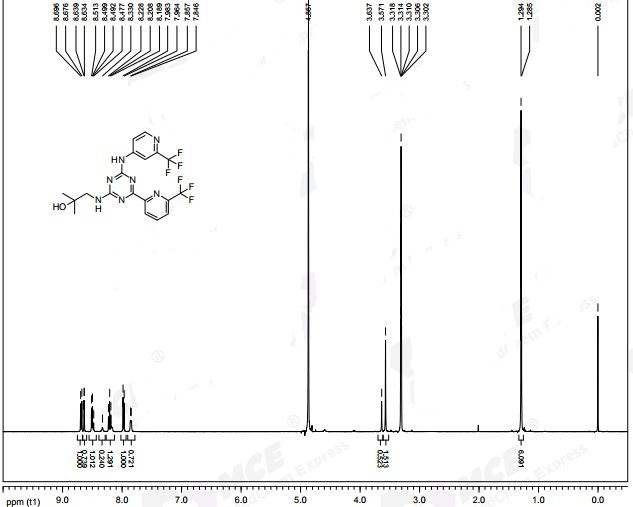 LC-MS: m/z 474.3 (M+H)+. Diethyl ether (4.32 L) and hexanes (5.40 L) are added to the reaction vessel under N2 atmosphere, and cooled to -75 °C to -65 °C. Dropwise addition of n-Butyl lithium (3.78 L in 1.6 M hexane) under N2 atmosphere at below -65 °C is followed by dropwise addition of dimethyl amino ethanol (327.45 g, 3.67 mol) and after 10 min. dropwise addition of 2-trifluoromethyl pyridine (360 g, 2.45 mol). The reaction is stirred under N2 while maintaining the temperature below -65 °C for about 2.0-2.5 hrs. The reaction mixture is poured over crushed dry ice under N2, then brought to a temperature of 0 to 5 °C while stirring (approx. 1.0 to 1.5 h) followed by the addition of water (1.8 L). The reaction mixture is stirred for 5-10 mins and allowed to warm to 5-10 °C. 6N HC1 (900 mL) is added dropwise until the mixture reached pH 1.0 to 2.0, then the mixture is stirred for 10-20 min. at 5-10 °C. The reaction mixture is diluted with ethyl acetate at 25-35 °C, then washed with brine solution. The reaction is concentrated and rinsed with n-heptane and then dried to yield 6-trifluoromethyl-pyridine-2-carboxylic acid. Example 1, Step 2: preparation of 6-trifluoromethyl-pyridine-2-carboxylic acid methyl ester Methanol is added to the reaction vessel under nitrogen atmosphere. 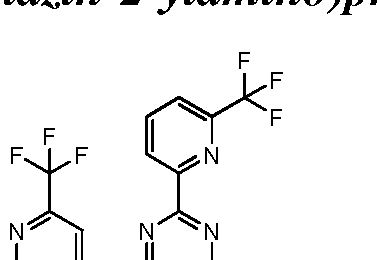 6-trifluoromethyl- pyridine-2-carboxylic acid (150 g, 0.785 mol) is added and dissolved at ambient temperature. Acetyl chloride (67.78 g, 0.863 mol) is added dropwise at a temperature below 45 °C. The reaction mixture is maintained at 65-70 °C for about 2-2.5 h, and then concentrated at 35-45 °C under vacuum and cooled to 25-35 °C. The mixture is diluted with ethyl acetate and rinsed with saturated NaHC03 solution then rinsed with brine solution. The mixture is concentrated at temp 35-45 °C under vacuum and cooled to 25-35 °C, then rinsed with n-heptane and concentrated at temp 35-45 °C under vacuum, then degassed to obtain brown solid, which is rinsed with n-heptane and stirred for 10-15 minute at 25-35 °C. The suspension is cooled to -40 to -30 °C while stirring, and filtered and dried to provide 6-trifluoromethyl-pyridine-2-carboxylic acid methyl ester. 1 L absolute ethanol is charged to the reaction vessel under N2 atmosphere and Sodium Metal (11.2 g, 0.488 mol) is added in portions under N2 atmosphere at below 50 °C. The reaction is stirred for 5-10 minutes, then heated to 50-55 °C. Dried Biuret (12.5 g, 0.122 mol) is added to the reaction vessel under N2 atmosphere at 50-55 °C temperature, and stirred 10-15 minutes. While maintaining 50-55 °C 6-trifluoromethyl-pyridine-2-carboxylic acid methyl ester (50.0 g, 0.244 mol) is added. The reaction mixture is heated to reflux (75-80 °C) and maintained for 1.5-2 hours. Then cooled to 35-40 °C, and concentrated at 45-50 °C under vacuum. Water is added and the mixture is concentrated under vacuum then cooled to 35-40 °C more water is added and the mixture cooled to 0 -5 °C. pH is adjusted to 7-8 by slow addition of 6N HC1, and solid precipitated out and is centrifuged and rinsed with water and centrifuged again. 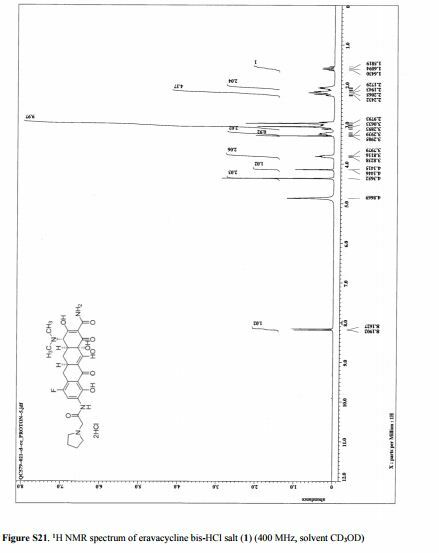 The off white to light brown solid of 6-(6-Trifluoromethyl-pyridin-2-yl)-lH-l,3,5-triazine-2,4-dione is dried under vacuum for 8 to 10 hrs at 50 °C to 60 °C under 600mm/Hg pressure to provide 6-(6-Trifluoromethyl-pyridin-2-yl)-lH-l,3,5-triazine-2,4-dione. 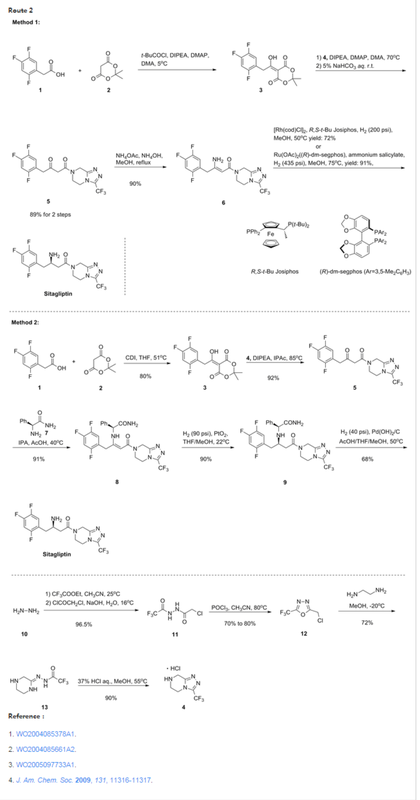 A mixture of THF (135 mL) and 2, 4-Dichloro-6-(6-trifluoromethyl-pyridin-2-yl)-l, 3, 5-triazine (27.0 g, 0.0915 mol) are added to the reaction vessel at 20 – 35 °C, then 4-amino-2-(trifluoromethyl)pyridine (16.31 g, 0.1006 mol) and sodium bicarbonate (11.52 g, 0.1372 mol) are added. The resulting slurry is heated to reflux (75-80 °C) for 20-24 h. The reaction is cooled to 30-40 °C and THF evaporated at below 45 °C under reduced pressure. The reaction mixture is cooled to 20-35 °C and rinsed with ethyl acetate and water, and the ethyl acetate layer collected and rinsed with 0.5 N HC1 and brine solution. The organic layer is concentrated under vacuum at below 45 °C then rinsed with dichloromethane and hexanes, filtered and washed with hexanes and dried for 5-6h at 45-50 °C under vacuum to provide 4-chloro-6-(6-(trifluoromethyl)pyridin-2-yl)-N-(2-(trifluoro-methyl)- pyridin-4-yl)-l,3,5-triazin-2-amine. 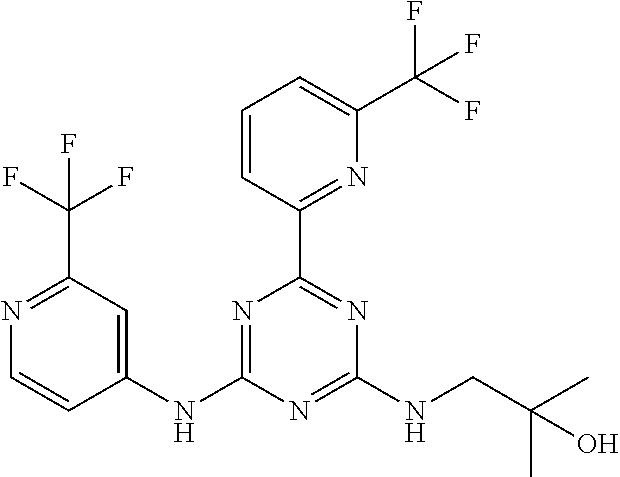 THF (290 mL), 4-chloro-6-(6-(trifluoromethyl)pyridin-2-yl)-N-(2-(trifluoro-methyl)-pyridin-4-yl)-l,3,5-triazin-2-amine (29.0 g, 0.06893 mol), sodium bicarbonate (8.68 g, 0.1033 mol), and 1, 1-dimethylaminoethanol (7.37 g, 0.08271 mol) are added to the reaction vessel at 20-35 °C. The resulting slurry is heated to reflux (75-80 °C) for 16-20 h. The reaction is cooled to 30-40 °C and THF evaporated at below 45 °C under reduced pressure. The reaction mixture is cooled to 20-35 °C and rinsed with ethyl acetate and water, and the ethyl acetate layer collected. The organic layer is concentrated under vacuum at below 45 °C then rinsed with dichlorom ethane and hexanes, filtered and washed with hexanes and dried for 8-1 Oh at 45-50 °C under vacuum to provide 2-methyl-l-(4-(6-(trifluoromethyl)pyridin-2-yl)-6-(2-(trifluoromethyl)- pyridin-4-ylamino)-l,3,5-triazin-2-ylamino)propan-2-ol. 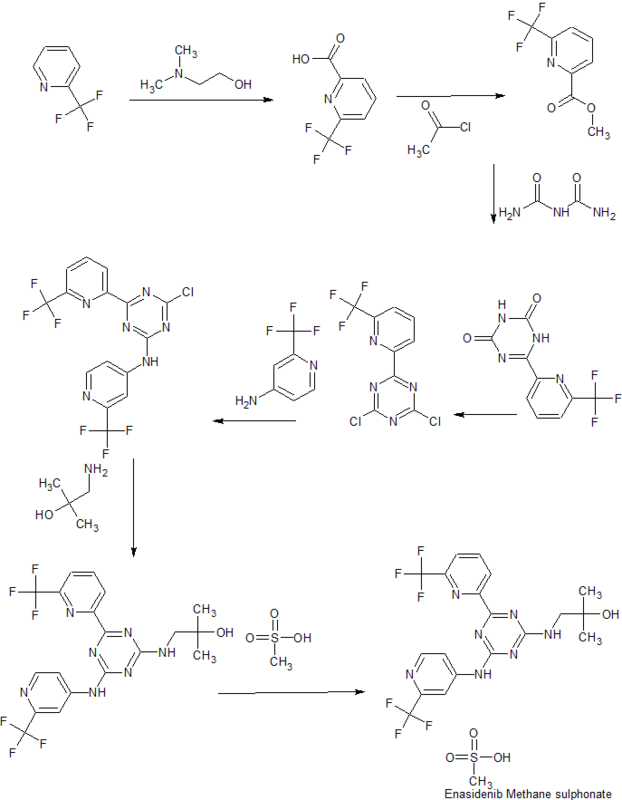 ^ Jump up to:a b “Enasidenib”. AdisInsight. Retrieved 31 January 2017. The U.S. Food and Drug Administration today approved Idhifa (enasidenib) for the treatment of adult patients with relapsed or refractory acute myeloid leukemia (AML) who have a specific genetic mutation. The drug is approved for use with a companion diagnostic, the RealTime IDH2 Assay, which is used to detect specific mutations in the IDH2 gene in patients with AML. 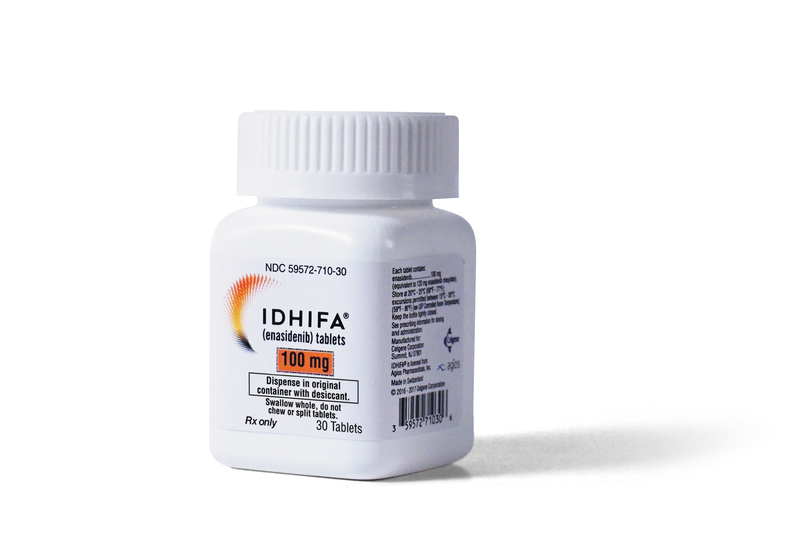 Idhifa was granted Priority Review designation, under which the FDA’s goal is to take action on an application within six months where the agency determines that the drug, if approved, would significantly improve the safety or effectiveness of treating, diagnosing or preventing a serious condition. Idhifa also received Orphan Drugdesignation, which provides incentives to assist and encourage the development of drugs for rare diseases. By DR ANTHONY MELVIN CRASTO Ph.D in 0rphan drug status, FAST TRACK FDA on August 2, 2017 .